Ebates is a no-brainer if you shop online! But in case you've been living under a rock or don't know how Ebates works this is a reminder for you! If you online shop at all you're probably already using Ebates. Basically when you want to shop anything online, any retailer, it's best to search on the Ebates website to see if they have an affiliation with them and if they do you can earn cashback on that purchase! 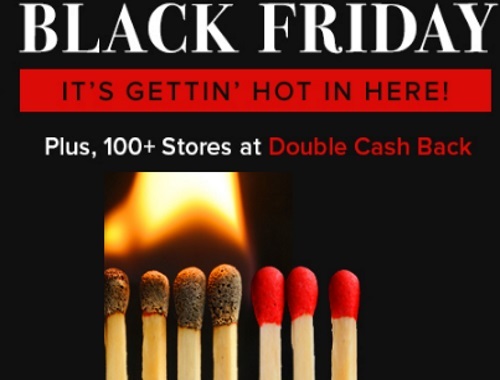 There are 100+ stores at Double Cash Back this Black Friday season! So that means while you are browsing through all the deals that we blog on CanadianDailyDeals.com you can also earn money back in the form of cashback by checking out using Ebates! Not an Ebates member yet? Get a $5 Welcome Bonus when you sign up using my link. After you complete your first order you will be credited $5 to your Ebates account. Click here to browse Ebates.